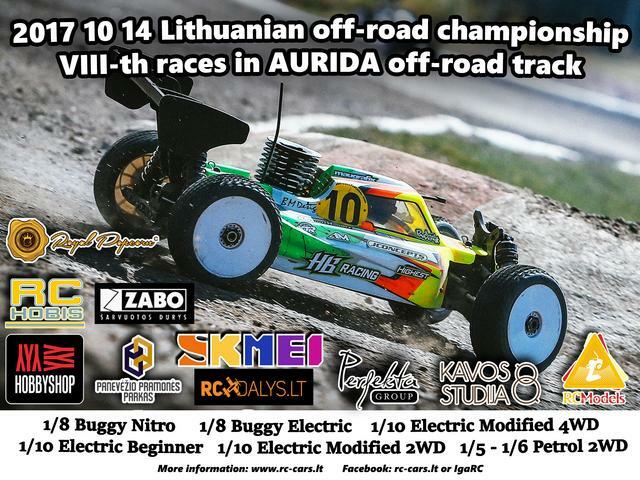 On 2017 10 14 „RC-CARS“ Association invites you to the VIII-th races of the Lithuania Off-road Championship 2017. Attention! It is the last race on AURIDA race track (the last time then you can race here), from the moment then this race will over, the track will be disassembled. After the race we will have a Final Ceremony of the year. Gatis Praulins and Oskars Abolins, if they are attend in the this race, will get prizes. So please wait. You have time to register into the races until Friday 24.00. You will could to order hot food under the race, which will be delivered in race area.